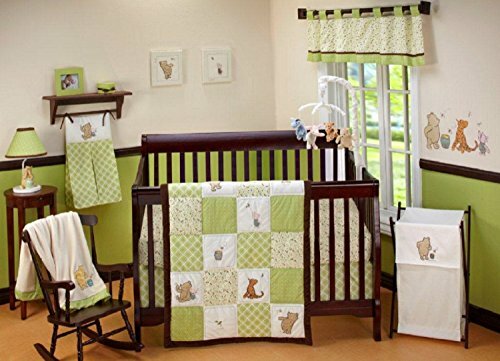 Classic Pooh - Storybook 6 Piece Crib Bedding Set - includes a comforter, two different printed fitted crib sheets, dust ruffle, a changing pad cover and a baby blanket with applique. Your little one will sleep sweetly surrounded by Disney's beloved Classic Pooh characters. The front of the 36" x 45" comforter features sweet scenes with Pooh, Tigger, Piglet, Eeyore, Kanga and Christopher Robin, in ivory, blue, sage and tan with a light warm beige border and back. The dust ruffle with a 16" drop features a solid light beige fabric. The two microfiber fitted crib sheets are made to fit standard size crib mattresses, with elastic all the way around for a snug fit. Keep your little one cozy with the solid ivory coral fleece baby blanket. The blanket features a beloved Pooh quote on a velboa applique in the bottom right corner, "Sometimes the smallest things take up the most room in your heart." Measures 30" x 40". The ivory changing pad cover fits onto a contoured changing pad, measuring 32 x 16 x 6" with elastic edges for a perfect fit. Cute and classic, the Classic Pooh Storybook collection is featured in shades of ivory, butter, light blue, sage, orange, little pops of pink and warm grey. 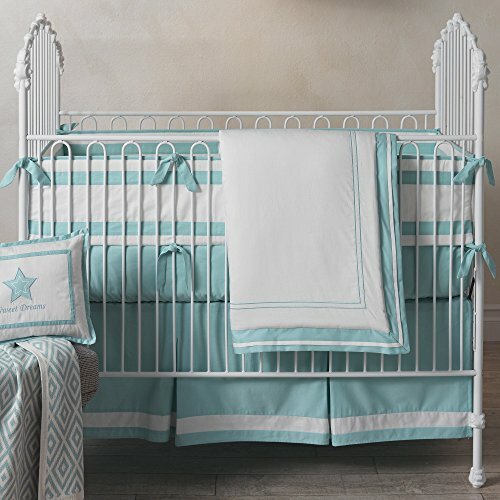 The Summer Infant Classic 4-Piece Bedding Set adds a timeless style to any nursery. 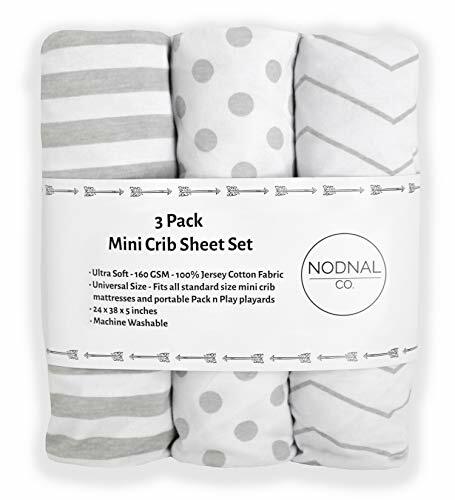 This all-in-one set includes a premium quilt for extra comfort and warmth during story time, 2 coordinating crib sheets, and an adjustable crib skirt. 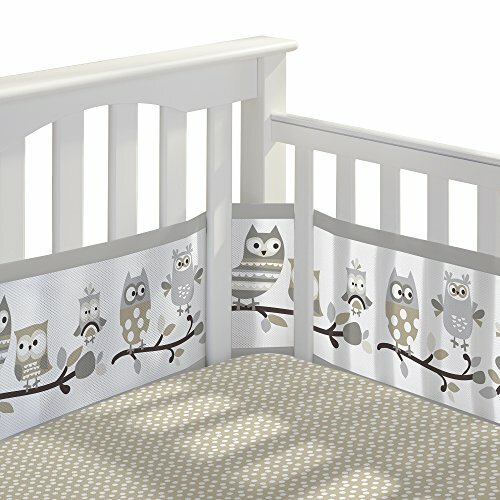 The unique, high quality crib skirt adjusts as crib mattress is lowered to keep your nursery looking beautiful. Our Breathable Crib Bedding Sets are a simple solution for a safe and stylish nursery. 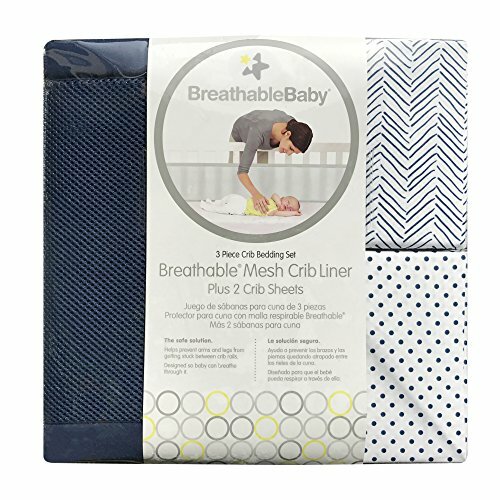 Each set includes our parent-loved-and-trusted Breathable Mesh Crib Liner along with coordinating cotton crib sheets in styles both traditional and modern. Create a Classic Pooh nursery with My Friend Pooh. Silly, willy, nilly ole bear "Winnie the Pooh" and fiends having fun on a blustery day in the 100 acre woods. Bowing dandelions with big wishes, eating honey, chasing bees and butterfly's. This whimsical collection is beautifully crafted with detailed patchwork, applique and embroidery. Features classic Winnie the Pooh, Piglet and Tigger. Colors are in fresh shades of fern green, crisp white, soft ivory and trimmed in chocolate. 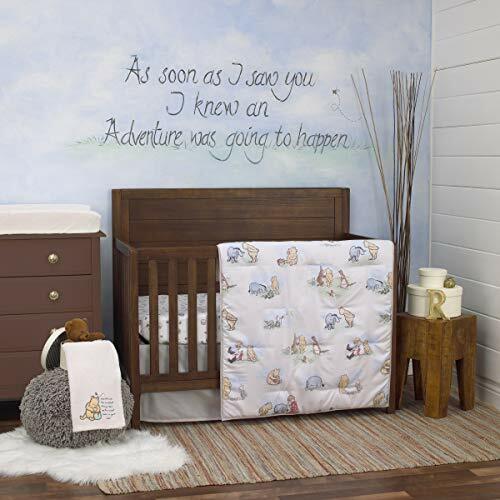 Create a Classic Pooh nursery with "My Friend Pooh". A full line of coordinating nursery decor and accessories are available. This set includes a coverlet, an aqua fitted sheet and a pleated dust ruffle. The coverlet is 100% cotton sateen with beautiful embroidered stitching and a stunning white and aqua border. Measures 35" x 44". The sheet is 100% cotton sateen and will fit a standard size 28 x 52 crib mattress. All of our sheets have extra deep pockets on the bottom for a secure fit. The dust ruffle has two pleats, is trimmed with a crisp white sateen band, and has a 16 drop. Want more Classic Crib Set similar ideas? Try to explore these searches: Nortel M2616, Cruiser Combo Kit, and The Perfect Wedding Cake.